Now TV, Sky's online streaming service, is launching an ad campaign to coincide with The Sun scrapping its paywall on Monday. The tactical ads, created by WCRS, will appear on The Sun’s website across the sport, football, Bizarre, showbiz and TV Biz sections between 30 November and 5 December. There will also be print ads in the newspaper. 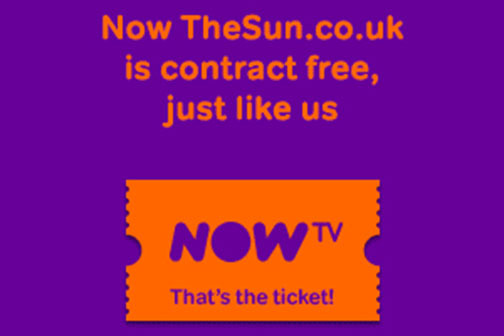 The work shows a Now TV ticket that explains, "Now TheSun.co.uk is contract free, just like us". The media planning and buying was handled by MediaCom. Pascal Wharton, the sales and marketing director at Now TV, said: "We have a reactive strand of our advertising that enables us to jump on opportunities where we can make Now TV highly relevant. "It continues to build on the success story of the brand in a light-hearted but effective way." The Sun put up a paywall in August 2013 but has relaxed the policy in the past few months, which has increased its average browser numbers to around one million. Dominic Carter, the managing director at News UK Commercial, said: "Cyber Monday marks an exciting new dawn for The Sun with the opportunity to reach brand new audiences. "This partnership with MediaCom and Now TV shows how media partners and brands can intelligently and creatively work together." Does The Sun going free spell the end for mass-market paywalls?